Super heroes are for the comic book, the cartoon world and for movies that are family friendly. Jack Shepard (Tim Allen) is such a super hero. He is presumed to be a washed-up hero from years gone by who has been employed by a private academy to help train the next generation of super heroes. There is an agenda to the academy of super heroes, though. Students are being trained for a very dangerous mission that neither the students, nor their instructor, knows about. The military has it on good authority that an evil super-villain has his sights set on the destruction of the Earth. Not everyone can be a super hero so the school holds admissions auditions. Some of the powers that the children possess are of no use to the military or the school who is training them and they are rejected from the program. Others, however, have skills and abilities that prove to be impressive to the staff and others. Telekinesis, invisibility, super strength, and the ability to expand to any size come in handy as the students chosen all possess one of these unique skills. The youngest is the strongest and she shows up for her super hero debut in a pink tutu and pony-tails. There is a teenage romantic interaction between the older students who are 17 and 16 years old, but it only slightly gets in the way of their education. When Jack learns of the plot to use children to fight off the super-villain, he objects and leaves the program. Concussion, the villain, has the ability to create seismic blasts that can rattle the Earth to its core. Zoom, Jack Shepard, is super-fast and can run circles around his competition. The twist comes at the end when we discover the relationship between Zoom and Concussion and how it always boils down to the final scenes. This movie is rated PG for some rude humor and language, as well as action scenes with hitting. 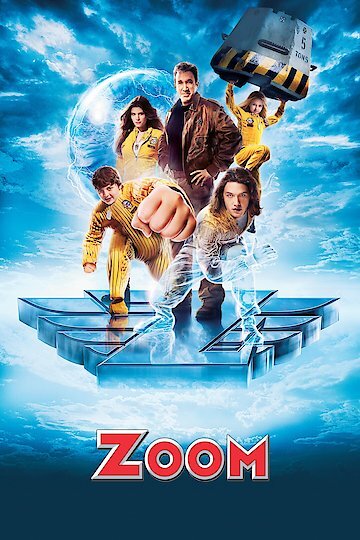 Zoom is currently available to watch and stream, buy on demand at Amazon, Vudu, Google Play, iTunes, YouTube VOD online.